The PYTHON CRIMSON GUARD is the créme de la créme of shock troopers. All Crimson Guardsmen must be college graduates and in top physical condition. The Python Crimson Guard is a master of infiltration and sabotage. 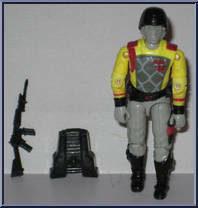 His function is to spy on his fellow vipers and report all violations of Cobra policy to the Python Patrol Commander. "This guy is too precious to be wasted on the conventional battle field. He is usually dispersed throughout the country, assuming an apparently normal appearance and life-style. Watch out. That friendly new neighbor of yours just might have a snake skin Python Patrol uniform hanging in his closet. . ."
Contribute pictures, update details or suggest corrections for Crimson Guard. Write a review about Crimson Guard.